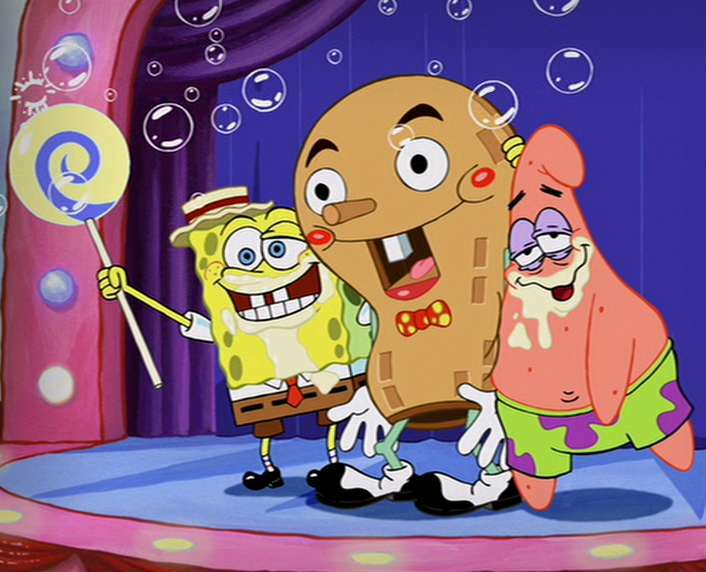 I'm a Goofy Goober, yeah! You're a Goofy Goober, yeah! WE'RE ALL GOOFY GOOBERS, YEAH! *Before I even arrived in Spain, I sat next to a warm, amiable individual on my flight. When we landed and parted ways, he wished me well with two kisses on the cheeks. This was the first of many “dos besos” I would receive in Spain. Now, if you are similar to me (a goofy-goober who savors the comfort of the personal bubble), you need to understand right now that it’s going to be a bit of a difficult adjustment for you. Plan to modify the dimensions of your personal space bubble whilst you are here in Europe. Be prepared to substantially shrink the radius of your bubble.Brace your eardrums for very loud dialogue (since most Spanish people tend to speak very loudly). Buckle up for conversations with people who put their face so close to yours that you can see your horrified reflection in their eyes. Stash up on the breath-mints. 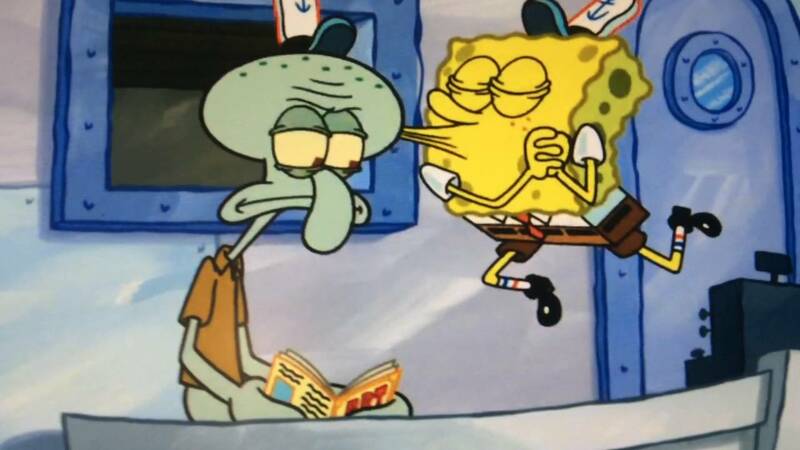 Most days I feel like Squidward in this picture. 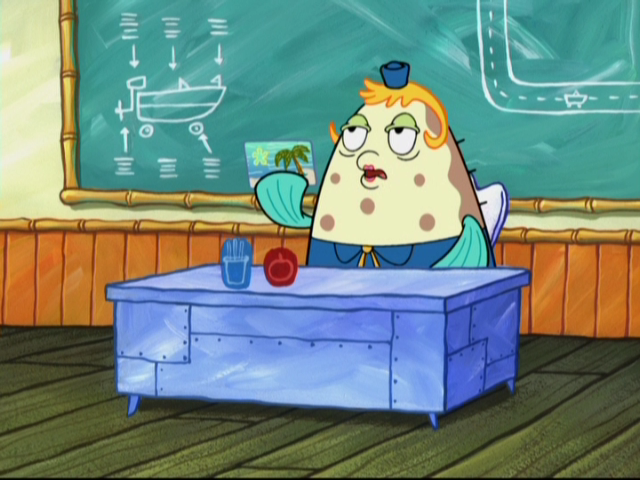 But in my classrooms I am Spongebob. HOWEVER, if you feel uncomfortable with your personal bubble being invaded, know that that is TOTALLY NORMAL. You aren’t going to be shunned or shamed if you want a little more space. Spanish people are not oblivious; they can read your body language. I’m almost certain that my host family and teachers noticed the stiffness of my posture after a few rounds of “dos besos” introductions and adjusted accordingly. They now provide me a bit more space within my bubble, sheathing their bubble-popping needles during the majority of our conversations. They greet me with warm hellos and bright smiles. And while I still have to engage in “dos besos” introductions and close-proximity conversations quite frequently, knowing that I do not have to relinquish all authority regarding the preservation of my personal space has greatly facilitated the adjustment. In summary, your personal bubble will be poked and prodded in Spain, but if you convey with your body language (or verbal language) that you are in a slight state of apprehension, people will typically acknowledge and respect your decision. BUT STILL BE PREPARED TO STEP OUTSIDE OF YOUR COMFORT ZONE. When I first arrived to Spain, I was dumbfounded when I discovered I had to wait until 9:00/10:00 to eat dinner every night. I could hear my stomach crying when the clock passed 7:00 and it had not been fed. However, after a few weeks or so, I started wondering whether or not the later meal time was actually better. Is it better to have 6-7 hours between lunch and dindin so you can fully engage in life without having to stop, sit, and eat? I am eagerly awaiting my return to the United States so I can discover whether I prefer the earlier/later meal times. Speaking of meal times, one important thing to know Spain is that, depending where you are placed, there are popular meals particular to each region. Here in Castilla y León, people LOVE to eat chickpeas and lentils. I’ve had them so many times, I can’t even begin to count. While there have been plenty of other occassions where we indulge in paella or pizza or pasta or spanish omlettes, you should prepare to eat the same meals quite frequently (although this really isn’t bad, considering the meals are always so scrumdidliumptious). I know I probably should have inserted a School House Rock picture here, but Goofy Goober rock seemed just as suitable. Okay, there's not actually a School House Rock in Spain, but it seemed like a cool title for this section. The absence of School House Rock is surprisingly not the only difference between Spanish classrooms and American classrooms (at least at my school). There are actually SO MANY. So I'll briefly list a few. DISCLAIMER: These differences are specific to my particular placement. It may be different in other schools. However, the friends I met through CIEE have echoed similar trends at their schools. Regardless, take these with a grain of salt. 1) Teachers do not have their own classrooms. Rather, each group of students is situated in one room and the teachers move from classroom to classroom. 2) There aren't as many colors in the classrooms (or furniture, for that matter). The classrooms are pretty empty, therefore making the echoes insane. 3) Both students and teachers show up late to class ALL OF THE TIME. The bell rang? Well you better start making your way to the classroom. While I am the type of person that believes being on time is being late, I have learned that (at least while I'm here) I don't need to run to my classrooms. *Note: This should not justify being late, and I still always am on time. 4) The pacing of classroom lessons is much more slow than back in the United States. This probably has to do with the more relaxed structure/schedule within my school, but it is still very readily apparent that there is not much urgency. Every experience is unique. I have no idea where you will be placed, or what your family will be like. Maybe they will want to binge Netflix with you every night in the living room. Maybe they will want to take you on weekend trips. Maybe they will want to talk with you, or maybe they won’t talk to you at all. Whatever the case, try to make the most of the situation. Don’t say no to something because it’s easier than saying yes. My mother once told me that it is easier to do nothing than to get up and change. Doing something new is a lot more difficult than doing something you’ve settled into. Take this experience as an opportunity to do things you wouldn’t normally do. Obviously, you do not choose to go to another country to stay within your comfort zone. You choose to go to another country to enrich yourself with the experiences and lifestyles of cultures different from your own. Embrace having meals that are 3-5 hours later than what you are used to. Speak as much Spanish as you can with as many people as you can. Go on walks and introduce yourself to dogs or chickens or lambs. Sit on a bench in the middle of a park, or outside a monument, or at a McDonald’s, and watch the world move around you. Visit a local supermarket or kid’s shop and buy some bubbles. The opportunities for adventure never end. Adventure, my friends, is out there.